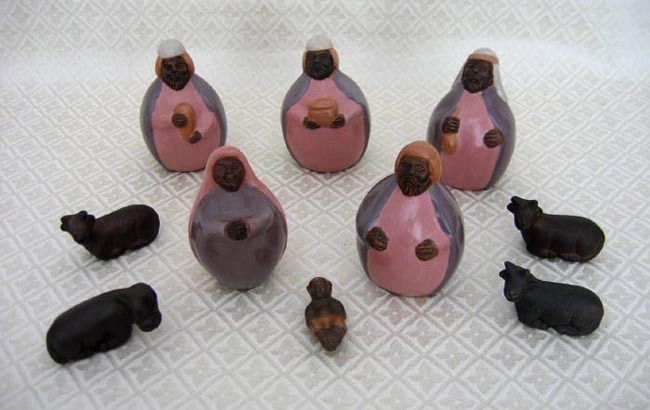 This clay Nativity set from Chulucanas Peru includes the Holy Family, three wise men with gifts, a cow and three oxen. The standing figures measure 4 inches tall. Clay pottery from Chulucanas, a small town on the north coast of Peru, is uniquely created. First, the piece is formed using several techniques: paddling, rolling, tableting, and using a wheel or an extruder. One artist, José Sosa, shapes his pottery using a small stone, a wooden paddle, and the inner sole of his foot. Once shaped and in a leathery state, the piece is painted with a slip made from clay and pigment. Then comes the burnishing or polishing which includes rubbing the entire visible surface with river stones of several forms and sizes to obtain a fully satin and homogenous surface. This operation is repeated three times and requires great skill so that the piece will not be damaged or cracked. Once dry, the figure is stacked in the wood-fired kiln and heated to a temperature of approximately 700 to 900 degrees centigrade.